Big things don’t need to come in big packages, and SmokTech’s newest TFV8 Baby Beast Tank is a perfect example. 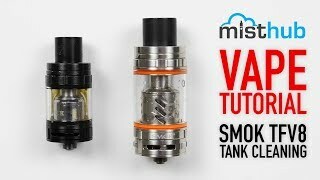 This Micro TFV8 promotes a smaller Stainless Steel/Pyrex Glass construction (1/3 smaller than TFV8 Cloud Beast) standing at 53mm tall and 22mm wide. The Baby Beast holds a maximum 3mL of E-Juice and premiers SmokTech’s latest air chamber design. The re-designed Delrin drip tip features bottom-pair air-slots that promote a powerful draw, backed by two wide airflow slots that can be adjusted via airflow ring near the base. The Baby Beast uses the same intuitive top-filling hinge-lock method that can be found on the Cloud Beast and previous TFV4 tanks. To fill the tank, simply twist the top cap to reveal the top-filling fill port. Fill the tank and twist the cap closed. Done. The highly anticipated TFV8 Cloud Beast was revolutionary due to the impressive Octuple Coil and Quad Coil configurations. Never before has the vape community had access to pre-built atomizer heads that offered such incredible power at such a low and affordable price. The TFV8 Baby Beast provides best-in-its-class cloud/flavor production by imitating the successful Octuple coil configuration in micro-nano fashion. Included with the Baby Beast is a pre-installed 0.4 ohm Dual Q2 Core that’s rated at 40-80W (best performance: 55-65W) and the ever-impressive 0.15 ohm Octuple T8 Core that’s rated at 50-110W (best performance: 60-80W). SmokTech also offers an RBA option (sold separately) for those vapers that prefer to build their own coils with the V8 Baby RBA head. The TFV8 Baby Beast will raise future expectations for cloud chasers and flavor connoisseurs when it comes to Nano Sub-Ohm tanks. 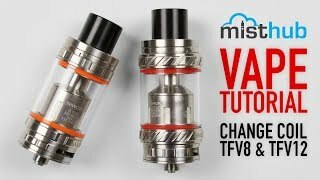 If the TFV8 Cloud Beast was too large for your current setup, the smaller/more manageable TFV8 Baby Beast is going to make all of your cloud chasing dreams come true. The Baby Beast is a powerful sub-ohm tank that features a standard 3mL fill capacity and is constructed out of stainless Steel and Pyrex glass. This attractive tank measures in at 53mm tall and is 22mm wide, featuring a heat-resistant delrin drip tip and a threaded 510 connection. Hardware customization, and the option to stand out in a crowd of vapers is one of the most important aspects of gear in the vape community, which is why Smok additionally provides two Smok vape bands (orange, black) included with the Baby Beast. 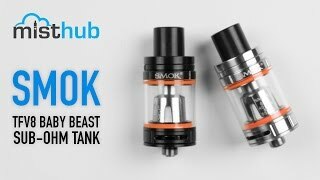 Smok also offers the option to switch the pre-installed orange o-rings with two red replacement o-rings, giving the Baby Beast a unique look that will match well with most of the mods on the market today. When compared to the TFV8 Cloud Beast, the Baby Beast is an impressive 16mm shorter and 2.5mm thinner in diameter. Despite the massive decrease in size, the Baby Beast can hold up to 3mL of your favorite e-juice for your all day vaping pleasure. The Baby Beast also features 1:1 renditions of the massive Cloud Beast atomizer heads, scaled down to size and comparable to the Cloud Beast’s high-powered vapor output. Each replacement atomizer head features a “suggested best use” wattage, letting the user know which wattage best suits the current coil being used. At this time, the V8-T8 atomizer head is the most powerful coil offered with the Baby Beast, providing a low-end operational wattage of 50W and an incredible 110W when taken to its high-end maximum.